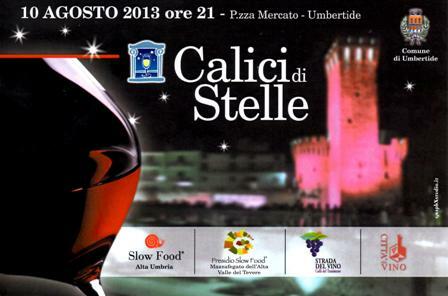 Also this year we are going to take part to the event Calici di Stelle, which will take place in Piazza del Mercato in Umbertide on August 10, during the “night of the shooting stars”. We will wait for you there from 9 p.m. in order to taste together our wines. There will be also other wineries and norcinerie (typical name for butcher shops in the center of Italy) of the area for a night in which you will be able to taste the wines and the typical products of the territory.